﻿Walt Disney's health had been deteriorating for many months before he finally agreed to enter St. Joseph hospital in California on November 2, 1966, for tests concerning the pain in his leg and neck. Doctors discovered a walnut-sized spot on the x-ray of his left lung and advised immediate surgery. Disney left the hospital to attend to studio business for a few days, then re-entered St. Joseph on Sunday, November 6, for surgery the next day. During Monday morning's operation, doctors found his left lung to be cancerous and removed it. His over-sized lymph nodes were an indication that Disney hadn't much longer to live. After two weeks of post-operative care, Disney was released from the hospital. He crossed the street to his studios and spent another ten days tending to studio business and visiting relatives before he grew too weak and had to return to St. Joseph on November 30. His health started to fail even more rapidly than expected, and drugs and cobalt treatments sapped what little strength he had left. 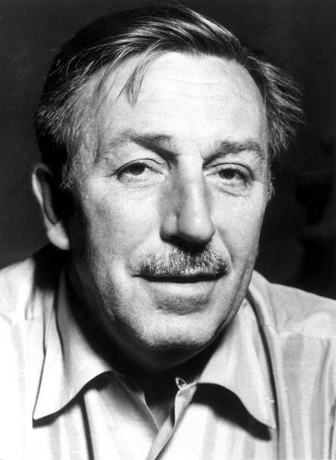 Walt Disney died two weeks later when his circulatory system collapsed on the morning of December 15, 1966. Was Walt Disney aware of the possibilities of life extension through cryogenics? He certainly could have been aware of the progress being made in cryogenics research. Numerous articles and books on hypothermia and the preservation of animal tissue through freezing appeared in both the scientific/medical and general press in the late 1950's and early 1960's. Anyone with an interest in the subject could easily have located this reading material, and even someone without a particular interest in the subject may have run across one or more articles on the topic in the general press. "The fact: At very low temperatures it is possible, right now, to preserve dead people with essentially no deterioration, indefinitely. The assumption: If civilization endures, medical science should eventually be able to repair almost any damage to the human body, including freezing damage and senile debility or other cause of death. Hence we need only arrange to have our bodies, after we die, stored in suitable freezers against the time when science may be able to help us. No matter what kills us, whether old age or disease, and even if freezing techniques are still crude when we die, sooner or later our friends of the future should be equal to the task of reviving and curing us." Given the prevalence of articles published about cryonics in the mid 1960's, and the relative popularity of Ettinger's book among science buffs (even if few of them had actually read it), it is certainly possible that Walt Disney was aware of the potentiality of cryonic storage of humans. Whatever the possibilities, however, there is no documentary evidence to suggest that Walt Disney was interested in, or had even heard of, cryonics. Documentation of Disney's alleged fascination with preserving or extending his life through cryonics did not appear until decades after his death, and what little information is available has predominantly been provided by some extremely questionable sources. 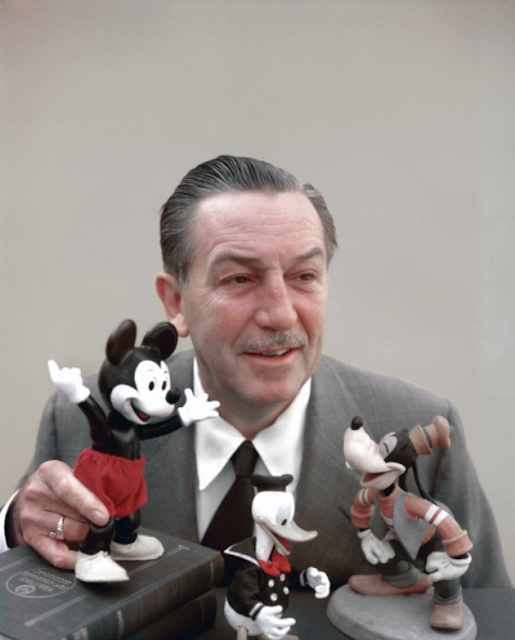 Claims about Disney's interest come primarily from two of the more recent Disney biographies: Robert Mosley's 1986 effort,Disney's World, and Marc Eliot's 1993 entry, Walt Disney -- Hollywood's Dark Prince. Both books have been largely discredited for containing numerous factual errors and undocumented assertions, rendering them rather untrustworthy as sources of reliable background material. "Disney's growing preoccupation with his own mortality also led him to explore the science of cryogenics, the freezing of an aging or ill person until such time as the human body can be revived and restored to health. Disney often mused to Roy about the notion of perhaps having himself frozen, an idea which received . . . indulgent nods from his brother . . . "
Not surprisingly, the source behind this piece of information is nowhere to be found in Eliot's notes. And as there is no record of Roy ever having spoken of his brother's alleged interest in cryonics, Eliot's "source" was likely nothing more than repetition of rumor. Mosley's Disney's World is also rather long on rumor and short on facts. The book has been described as "poorly researched and filled with inaccuracies", a biography that seemed "to promote certain preset points of view, regardless of evidence". The same critique goes on to say, "One of its central themes, for example, is Disney's fascination with cryogenics and the strong suggestion that his body was frozen following his death." It makes for titillating reading; however, few facts support Mosley's claims. 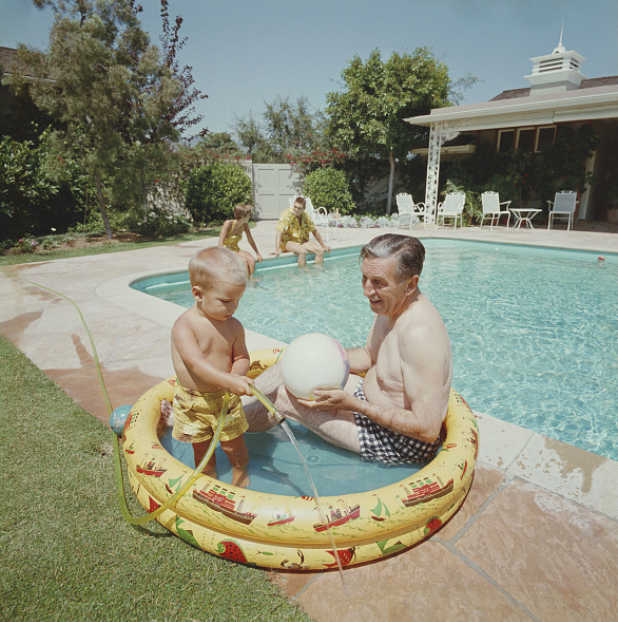 "[T]he chief problem that troubled Walt was the length of time it might take the doctors to perfect the process. How long would it be before the surgical experts could bring a treated cadaver back to working life? 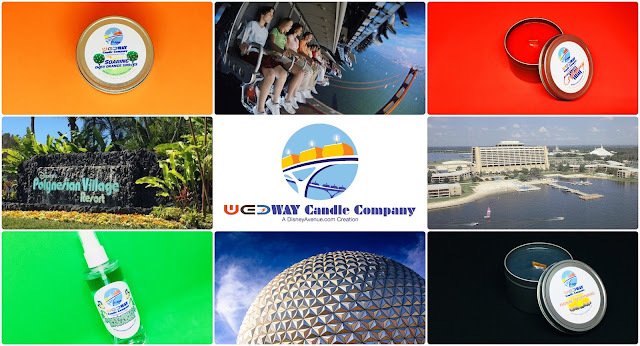 To be brutally practical, could it be guaranteed, in fact, that he could be brought back in time to rectify the mistakes his successors would almost certainly start making at EPCOT the moment he was dead?" "The surgeons had taken away his diseased lung to examine it, and then were going to preserve it. Walt was pleased when he heard that. He knew enough about cryogenesis by now to be aware that it was important to hold onto all the organs -- just in case the surgeons needed to treat them before putting them back where they belonged." 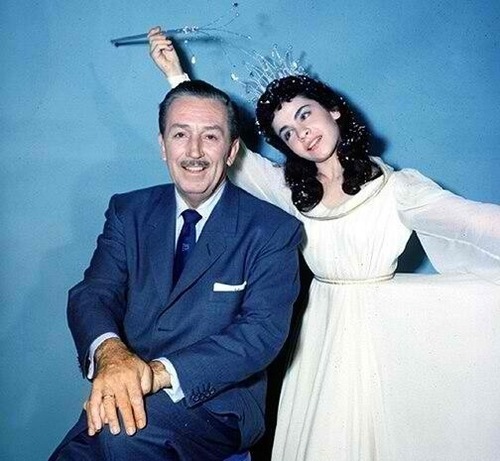 "There is absolutely no truth to the rumor that my father, Walt Disney, wished to be frozen. 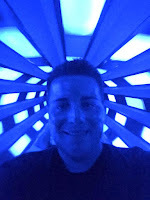 I doubt that my father had ever heard of cryonics." Walt Disney publicly stated -- ten years before his death -- that he wished not to have a funeral. Disney family members have confirmed that cremation was Walt's wish. A marked burial plot, for Walt Disney (and his son-in-law) can be found at the Forest Lawn Memorial Park in Glendale (the logical resting grounds for someone whose cremation was handled by Forest Lawn's mortuary), and court papers indicate that the Disney estate paid $40,000 to Forest Lawn for interment property. "Disney had a long preoccupation with death"
"Disney had a neurotic fear of death"
Statements concerning Disney's alleged preoccupation with death are generally attempts to sensationalize the topic by distorting the facts. Although he did worry about dying prematurely, Disney was not "obsessed with death". Having been told by a fortune-teller that he would die when he was thirty-five, Disney did brood about his inevitable demise during occasional bouts of depression, even after he had long passed the allegedly fatal age. Contemplating one's mortality is not an unusual behavior, and there is no evidence that Walt Disney did so to an excessive degree. William Poundstone quotes some ridiculous passages from Anthony Haden-Guest's The Paradise Program to try to establish Disney's preoccupation with death, detailing a "gruesome seven-minute Mickey Mouse cartoon" made in 1933 in which "a mad scientist tries to cut off Pluto's head and put in on a chicken. The cartoon in question is The Mad Doctor, which was nothing more than humorous spoof of 1930's horror films. Even in the cartoon itself the "horrific" events are not portrayed as real: the whole episode turns out to be nothing more than a nightmare of Mickey's. Although Poundstone wrote that the film was pulled from the Rank film library in 1970, it has been readily available in the Mickey Mouse: The Black and White Years laserdisc set since 1994. "The news of Disney's death was deliberately delayed." "And this is where the mystery begins. It was Walt himself who had asked Roy Disney to keep his illness secret, but the manner in which the world was apprised of his death remains surprising. In fact, it was not until hours after he was declared dead that an announcement was made. 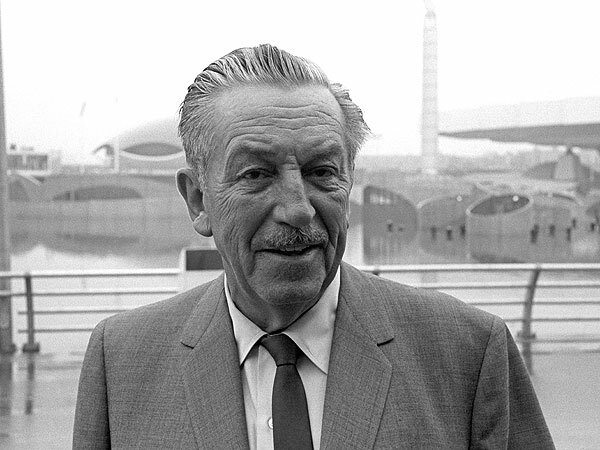 First came radio announcements, then a curt official notice informed the press and public that Walt Disney was no more. It added that there would be no funeral. He had already been cremated, the announcement said, and his ashes interred in the Forest Lawn Memorial Park in Glendale, California. Only immediate family members had been present." It is true that Disney's death was not officially announced to the press until several hours after it occurred at 9:30 AM on Thursday, December 15, 1966, but the reasons behind the delay were perfectly ordinary ones. First of all, Disney's death would not have been announced immediately under any circumstances. Several family members had to be notified before a public announcement could be made, and Disney studio executives had to be located and informed that the head of their organization had passed away before the information would be released to the press. Additionally, the gravity of Disney's illness had largely been kept a secret from the press, so there were no hordes of reporters crowding the hallways of St. Joseph Hospital, waiting for the inevitable announcement of his death. The reason for Disney's original hospitalization had been announced to the press as "treatment of an old neck injury received while playing polo," and when Disney re-entered the hospital for the final time two weeks before his death, the statement made to the press was that Disney was undergoing "a routine post-operative" checkup. Although it was certainly no secret that Disney was quite ill, the seriousness of his condition was not generally known. The extent to which the details of Walt Disney's illness were kept from the press are evidenced by the newspapers reports of his death, which stated that his left lung had been removed during an operation on November 21 (an error which Poundstone repeats in Big Secrets). That operation had actually taken place two weeks earlier; November 21 was the date of his original post-surgery release from the hospital. So, given that relatives and studio heads had to be notified before any statements about Disney's death were made to the press; that the media were not on a "Disney death watch," busily preparing obituaries and tributes; and that communications in 1966 were certainly slower than they are today, it is not at all surprising that official news of Disney's death did not reach the public until a few hours later. Mosley's other statements, about Disney's funeral and cremation, are just further examples of sloppy research on his part. 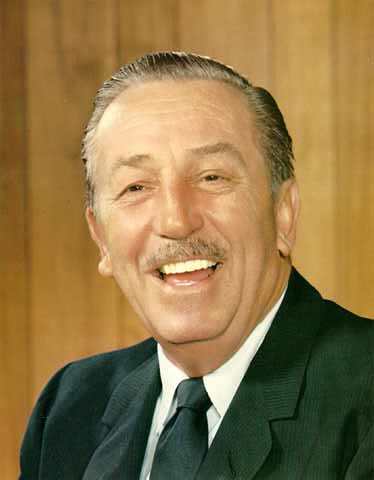 Disney was not cremated until two days after his death; no press announcement made "hours after he was declared dead" claimed that he had already been cremated. "The cause of Disney's demise was never formally announced." This statement is both inaccurate and irrelevant. 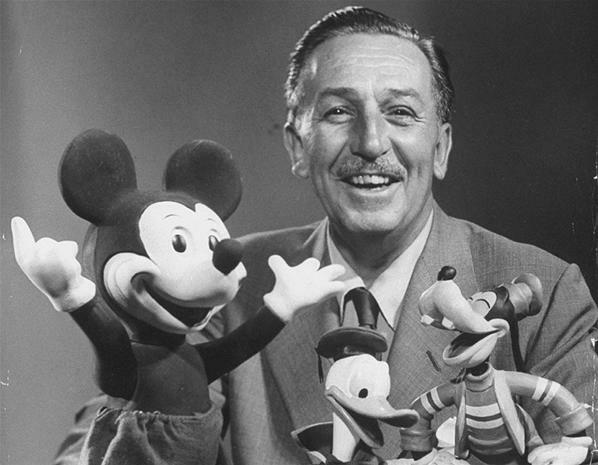 The cause of Disney's death was initially announced as being "acute circulatory collapse," which meant simply that his heart had stopped beating. As facile as the official announcement may seem to those who know he "really" died of lung cancer, it does reflect the proximate cause of his death. This notion is borne out by the official death certificate, which lists "cardiac arrest" as the primary cause of death. The fact that cancer was what caused Disney's heart to give out was, medically, of secondary importance. Official statements released to the press after Disney's surgery (and before his death) had already revealed that a tumor had been found, necessitating the removal of a lung. Whether stated "officially" or not, it was quite clear to the public that Disney had died of lung cancer. In any case, what possible difference could it have made what Walt Disney died of? How could dissembling about the "real" cause of his death possibly have facilitated the goal of secretly storing his body in a cryonic chamber? "Disney's funeral services were held in secret." Disney's funeral was in fact conducted quickly and quietly -- at the Little Church of the Flowers in Forest Lawn Cemetery, Glendale -- at 5:00 PM on Friday, December 16 (the day after his death). No announcement of the funeral was made until after it had taken place, no associates or executives from Disney Studios were invited, and only immediate family members were in attendance. Forest Lawn officials refused to disclose any details of the funeral or disposition of the body, stating only that "Mr. Disney's wishes were very specific and had been spelled out in great detail." "He never goes to a funeral if he can help it. If he had to go to one it plunges him into a reverie which lasts for hours after he's home. At such times he says, 'When I'm dead I don't want a funeral. I want people to remember me alive.'" 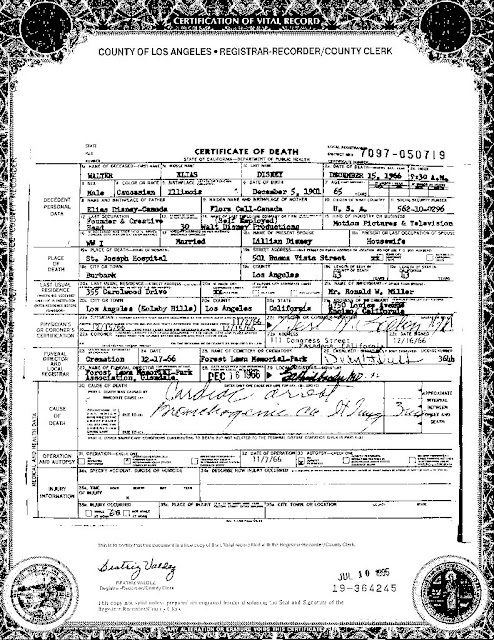 Is it so remarkable that a man who had an aversion to funerals -- and who had stated a ten years earlier that he didn't want a public funeral -- was sent off with a very quick and very private ceremony? If the clandestineness of the funeral had been intended to cover up the fact that Disney's body had already been deposited in liquid nitrogen at a secret facility, there were certainly better, less obvious ways of accomplishing the deception: Disney could have been given a simple closed-casket ceremony, with nobody the wiser. 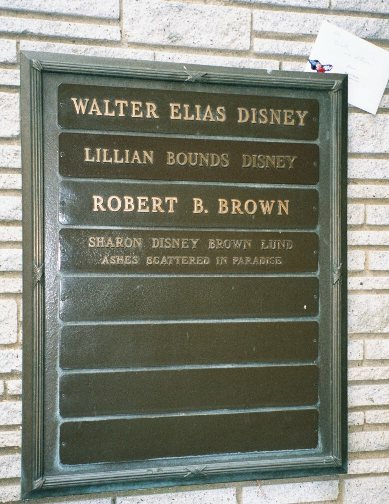 "Disney specified the public was never to be told the location of his grave." Again, this claim is not the least bit extraordinary. It is true that officials at Forest Lawn Memorial Park will not divulge the location of the Disney family plot. Many celebrities do request that the locations of their burial plots not be given out to visitors as a simple matter of privacy. The burial sites are not intended to be "secret," however; if they were, they wouldn't be marked and located on publicly-accessible grounds. Disney's plot was not, as Mosley claimed, "already filled with family ashes from which the public would always be barred." Disney's plot is far from obtrusive, but it is located in an unrestricted part of the park and marked with a plaque identifying its occupants; anyone who so desires is perfectly free to visit, leave flowers, take photographs, etc. The plot was certainly not "already filled with family ashes" at the time of Disney's interment; even today it holds the remains of only one other person: Ron Brown, a son-in-law who died the year after Disney. In fact, according to the book Wills of the Rich and Famous, the interment property was not even chosen until September 19, 1967, making it rather difficult to believe that it could have been "already filled with family ashes." If Disney was not really frozen, then how and when did this rumor originate? The exact origins of the rumor are unknown, but at least one Disney publicist has suggested that the story was started by a group of Disney Studio animators who "had a bizarre sense of humor." The earliest known printed version of the rumor appeared in the magazine Ici Paris in 1969. Even if the origins of the story are unknown, it is certainly easy to see why the rumor is so believable. 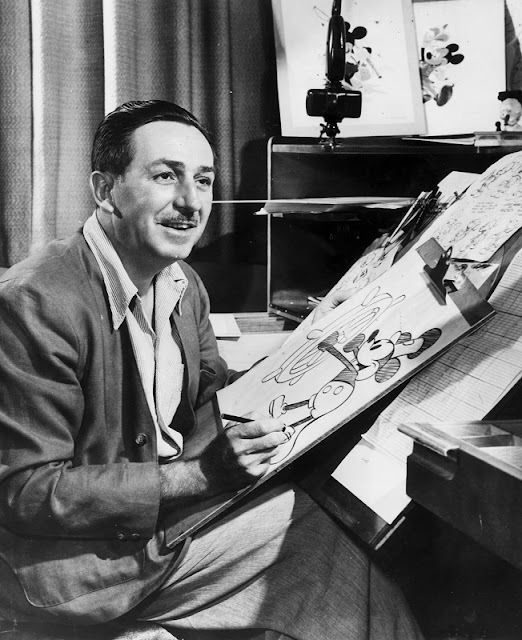 In the years immediately preceding his death, Disney was involved in a number of projects which cemented his image as a technical innovator in the public's mind. Disneyland attractions such as the monorail, the House of the Future, the Voyage to the Moon; the introduction of audio-animatronic figures at the 1964 World's Fair, and Disney's plans for his "community of tomorrow" (EPCOT) in Florida made it easy to believe Walt Disney was ahead of everyone else in his planning, even when it came to his death. When you consider that the first cryonic suspension took place just a month after Disney's death (Dr. James Bedford, a 73-year-old psychologist from Glendale, was suspended on January 12, 1967), it's not so far-fetched to imagine that Disney could have made similar arrangements. So, there we have it. 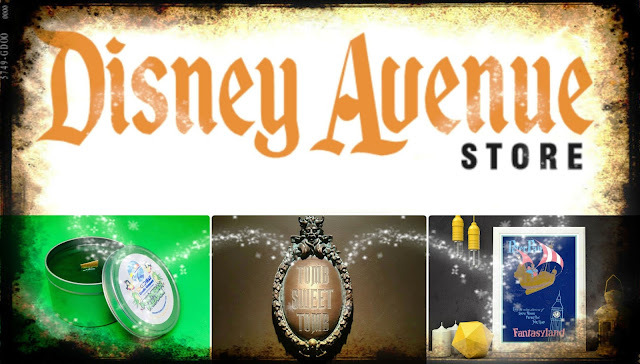 This highly informative article explains, in great detail, the events following Walt's passing and where the urban legend originated. Walt was a wonderful man, a real American success story. Although we know Walt Disney was never cryogenically preserved, his spirit certainly does continue to live on in his Parks... and for that we can be thankful. VERY, VERY INTERESTING! Thanks for a GREAT article! Will any one ever write a REAL biography of Walt? I wish...the man was amazing! What is Gabler's book if not a "real" biography? You say he was cremated two days after his death, which if he died on the 15th of December 1966m then his cremation would have taken place on the 17th of December 1966, but yet his Funeral was on the 16th? maybe im missing something? On December 15, 1966, Walt Disney died from complications of lung cancer, for which he had undergone surgery just over a month earlier. A private funeral was, in fact, held the next day, and on December 17, his body was cremated and interred at Forest Lawn Memorial Park in Glendale, California after the private funeral took place.